When you are driving a Porsche, you are driving in luxury and style. All models of Porsche have distinct designs that are easily recognizable and will turn heads in any setting. Whether you have an SUV size for your family or a roadster for just you, the sleek designs will set your Porsche apart from all the other vehicles on the road. In addition to the style of the Porsche, your vehicle will have a performance level to match that sleek look. Each Porsche is built with power, speed, but also safety capabilities that set them apart from the rest. Like any vehicle, as your Porsche ages, certain issues become more likely to arise. Even with the best maintenance and care, some problems are just unavoidable. One of these issues that you may come across is ignition coil failure. Below, we’ll discuss some clues that your Porsche will give you if the ignition coil is failing. If you start noticing any of these clues in your vehicle, you should bring your Porsche in for an inspection by a certified technician. The first major clue that your Porsche is experiencing ignition coil failure is if the vehicle will not start. In order for the engine to receive the sparks that it needs to start, an electric charge has to travel from the ignition coil to the spark plugs. If there is an issue with the ignition coil then the spark plugs will not get the charge needed to start the vehicle. Another related issue to the ignition coil failing is going to be your Porsche stalling. As your vehicle attempts to work around the ignition coil failing, it will shoot off irregular sparks. These irregular sparks will cause your vehicle to stop or completely shut off when it was running correctly. Once your vehicle stalls, you will need to restart it. If the ignition coil has not completely failed yet, then your Porsche may be able to start up again. An additional clue that your Porsche has a failing ignition coil is going to be engine backfiring. The ignition coil works with the mixture of fuel and oxygen that is required for the engine to function properly. If the fuel is not being used efficiently, the unused fuel will end up making its way through the exhaust systems, causing your Porsche to backfire. The exhaust system is not designed to handle fuel going through it, so if left unchecked the exhaust will eventually emit black smoke and you will smell gasoline. To help prevent ignition coil failure leading to other problems in your Porsche, take the vehicle into a professional Porsche repair shop to have it serviced the first time you hear a backfire,. Moisture on the ignition coil can cause it to fail. One source of moisture can come from an oil leak. If there is an issue with the valve cover, then oil is going to leak out of it and onto the ignition coil. Once the ignition coil has oil on it, the coil can no longer transfer the spark to the spark plug, which will then lead to the issue of your Porsche not starting. 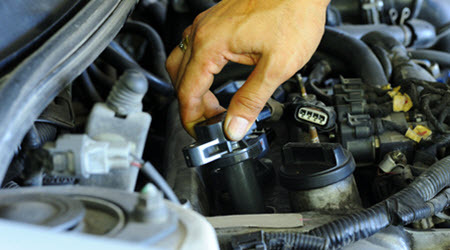 Another source of moisture that can negatively affect the ignition coil is water. Generally this is overlooked because vehicles are made to prevent water from getting in the spaces underneath the hood, but what about the water that is already under the hood? Condensation from the air conditioner can build up easily in spaces around the engine. If the condensation builds up enough, then it could drip onto the ignition coil and the spark needed for the engine will be lost. If you have noticed any of these clues pointing to ignition coil failure in your Porsche, then it is time to take it into Revolution Automotive Services. Conveniently accessible from the Norwood, Westwood, Walpole, Sharon, Canton, Medfield, Needham, Dover, and Boston, MA areas, you will always be greeted by a certified technician who will ensure that your Porsche is properly inspected. After a complete and through diagnostic is completed, the source of the ignition coil failure will be identified and addressed. The ignition coil will also be replaced using the best quality part, while costing you a fraction of the price. Call or come by today to get started on the road to quality maintenance and -repairs for your Porsche.